The bill signed into law by Seattle Mayor Ed Murray on Tuesday to raise the city’s minimum wage to $15 an hour by 2021 is historic. It will more than double the current federal minimum wage of $7.25 — something no local government has ever done. An estimated 46 percent of Seattle’s 100,000 workers who make under $15 an hour will earn that by 2018. The measure could pump $3 billion into the local economy over the next decade, cutting poverty by 30 percent. It is already resonating, as $15-an-hour campaigns are underway in Chicago, Los Angeles, Portland, and San Francisco. New York Gov. Andrew Cuomo just endorsed a plan that could raise the minimum wage in New York City to $13 an hour. Seattle’s new law has downsides, however, including a seven-year timeline, a lower training wage aimed at teenagers, weak enforcement provisions that encourage wage theft, and allowances for businesses with fewer than 500 employees to count tips and healthcare benefits reflected on pay stubs as wages up to $3 an hour. But workers elsewhere who flip burgers, fold sweaters, and pull shots of espresso for a living wonder if the victory in Seattle can be replicated. That depends on understanding how it was won. There was no guarantee a year ago that the “$15 an hour” slogan would become law. The driving force was Kshama Sawant, an avowed socialist who voters elected to the City Council last November on a platform to raise the minimum wage and taxes on the wealthy. She and her political party, Socialist Alternative, mobilized pressure for a wage bill. They fought opponents for months, parrying attempts to block the increase. She and her partners made the most of a limited hand nevertheless. Sawant pursued a broad platform, but Socialist Alternative soon realized that $15 an hour should be the banner issue because of the amount of support it generated. The momentum became unstoppable after local newsweekly The Stranger gave Sawant a full-throated endorsement in September. Murray, who was running for mayor at the time, quickly endorsed the measure as well. After taking office, Murray appointed a business-heavy Income Inequality Advisory Committee to devise a proposal. Sawant and Socialist Alternative countered by establishing 15 Now, a group that organized public marches and rallies, set up chapters in 11 neighborhoods, and canvassed widely. Meanwhile, some Seattle restaurant owners pushed their staffs to oppose the $15-an-hour increase. Jess Spear, 15 Now’s organizing director, told VICE News that two prominent restaurateurs told their staff that prices would increase and that they would lose tips and even their jobs. A group composed of servers and bartenders called Tips ARE Wages threatened to turn a key group of workers against the proposal. But Spear said that 15 Now met with the group and won them to their side after leaked documents revealed that restaurant owners were orchestrating the anti-$15 campaign. But rallies and meetings are little match for billion-dollar corporations, which put small-business owners out front, moaning that jobs and business would be lost if $15 an hour became law. In March, Sawant and 15 Now made a strategic retreat by conceding that small businesses should have a longer phase-in period for the increase. At the same time, they deftly argued that businesses like McDonald’s, which amassed $5.5 billion in profit last year, could afford a much quicker timetable. Meanwhile, 15 Now launched a ballot initiative to remind councilmembers that if they failed to pass a strong bill, voters could decide the issue for themselves. On April 26 it held a national conference in Seattle where attendees approved a plan that established a $15 an hour increase by 2017, with no tip credit or training wage. The conference was timed to anticipate the unveiling of Murray’s proposal on May 1. The Stranger noted that Murray’s plan was “so complicated reporters can’t understand it,” but it did take the wind out of 15 Now’s sails because it gave the impression that the battle had been won. Labor leaders quickly closed ranks behind Murray. “It’s a very delicately constructed deal and my advice to council would be to change nothing,” David Rolf, the president of the 40,000-member Service Employees International Union 775, told me in early May. He said that a ballot initiative would result if the measure were watered down — but that’s exactly what happened. The bill introduced on May 15 was weakened with a training wage, the tip/healthcare allowance, a three-month delay, and slap-on-the-wrist enforcement measures. Rolf still reversed course. “We fully support the ordinance,” he later said. Socialist Alternative’s leaders privately conceded that they couldn’t win a ballot initiative without full support from organized labor, but they pushed one forward anyway to keep up the pressure on the council as it considered the ordinance. The City Council approved the bill on Monday afternoon, sending it to Murray’s desk for his signature. Though the push for a $15 minimum wage is expected to go national, it’s unclear whether 15 Now will find similar success in other big cities. Sawant was aided by unusual factors like a non-partisan election and The Stranger’s backing. Even so, the proposal’s success in Seattle demonstrates a new model of grassroots resourcefulness that has the potential to widely advance a pivotal social agenda. How did the biggest-ever mobilization of fast-food workers come about, and what is its endgame? The Service Employees International Union (SEIU)-backed campaign to organize fast-food workers nationwide is on a roll. It’s entering its second year in the public eye, having staged four one-day strikes, culminating in a 60-city walkout on August 29. It’s a bold move by one of the nation’s largest unions to organize an unorganized private-sector workforce numbering in the millions. The movement has no official name, though each city-level campaign has one: Fast Food Forward in New York, Raise Up MKE in Milwaukee, We Can’t Survive on $7.35 in St. Louis, Stand Up KC in Kansas City, and, in Chicago, Fight for 15 (which refers to a $15 minimum wage and has become the name most commonly used for the national campaign). The campaign has revived the use of the strike to build worker solidarity and employs a strategy of minority unionism, which aims to build a core of militant workers who can sidestep labor law that nowadays hinders worker organizing more than abuses by management. Most importantly, the fast-food organizing campaign has set in motion thousands of working poor, mainly African Americans and Latinos, who are acting collectively to better their lives. The campaign is generating excitement that a popular movement can finally go on the offensive against corporate power. Why fast food, and why now? Simply put, it’s where a dying labor movement sees the most opportunity. Private-sector union density has plunged from its peak of 35 percent in the 1950s to only 6.6 percent now. One of the key factors in labor’s decline has been the growth of the non-unionized service sector, where low wages have become the norm and workers who try to organize often face retaliation. Workers in the fast-food industry, which employs more than 4 million Americans, earned an average of $8.72 an hour in 2010. The fast-food organizing campaign is one of many efforts to organize the low-wage sector, along with OUR Walmart, warehouse worker and university adjunct campaigns, and the spread of worker centers. But it’s the one that has generated considerable media buzz and excitement among organized labor and progressives. So what exactly did set the movement off? And could its development serve as a model for future campaigns? To discover exactly how Fight for 15 began and grew and whether we can expect similar upsurges among other groups of workers, In These Times talked to 40 low-wage workers, labor organizers, reporters, historians, union officials and media strategists. All of the more than 20 organizers and workers who discussed their involvement requested to speak on background or be identified by pseudonyms, expressing fear of damaging either job prospects or relationships with others involved in the campaign. Based on these interviews and hundreds of pages of internal documents from the campaign, In These Times can offer the most detailed examination to date of how Fight for 15 originated, what its goals are, where it might be headed and who is making the decisions. Nearly all of the low-wage workers and organizers involved in the campaign who spoke with In These Times expressed concerns about the campaign’s direction. They made clear they do support Fight for 15—often enthusiastically—for providing space for workers to build relationships, share knowledge and, in some cases, embark on shop-floor organizing. But many questioned whether Fight for 15 is fundamentally a worker organizing campaign or a “march on the media,” and many believe the endgame will be determined by an SEIU leadership that is not in contact with the daily realities of the campaign. But three former organizers in Chicago who joined the campaign in late 2011, and two former organizers with NYCC who began petitioning in March 2012, all dispute this story. 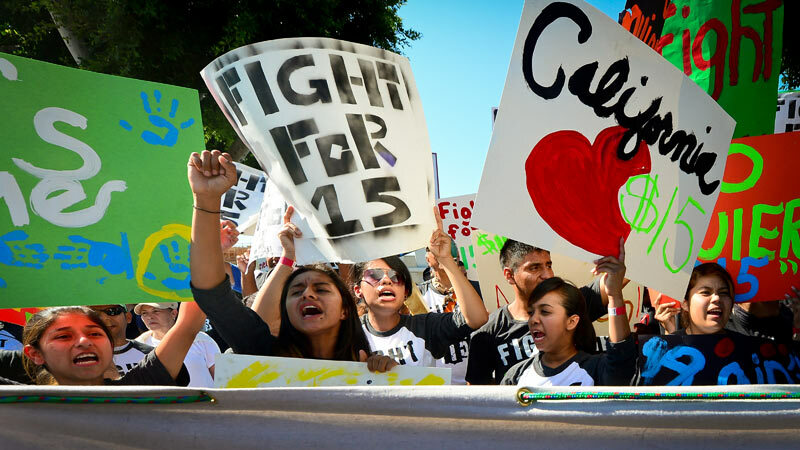 All say that from the get-go, the stated goal was to organize low-wage or fast-food workers. All say they were told within weeks or months that SEIU was funding the organizing, and all say that it became increasingly clear that SEIU was directing the campaign. Sidney (not his real name) says that when Action Now hired him in November 2011, it was to join a campaign to raise the minimum wage. For the first few weeks, organizers armed with postcards calling for a $10-an-hour state minimum wage prowled fast-food and retail joints in the Loop in downtown Chicago and gathered names, phone numbers, emails and home addresses to meet daily quotas. But when managers started kicking the organizers out of establishments because they were talking to workers about low wages, Action Now changed tactics, according to Sidney and Maria (not her real name). Maria, who was hired by Action Now in December 2011, says she and other organizers “started to brainstorm what can attract people’s attention … and everybody said, ‘Well you know a lot of these workers take public transportation.’ So we made it about public transportation and stopping the fare hikes.” There was some media speculation around hikes at the time, but no specific proposal on the table. According to Sidney, he and Action Now organizers came up with “a scenario where the CTA [Chicago Transit Authority] was raising the prices. … From then on, we started going around to the same establishments in the Loop and telling them the CTA was going to raise the prices two, three bucks.” The tactic worked, the organizers say: The petition met with less opposition from managers than the minimum-wage postcards. Maria, Brooke and Sidney say they soon learned that SEIU was bankrolling the project. Sidney says that early in the campaign, Action Now leaders were meeting with SEIU officials and saying they were trying to secure money. In December 2011, SEIU’s Washington, D.C. headquarters disbursed about $36,000 to Action Now for “Support for Organizing.” Sidney says that in January, Action Now leaders told them, “SEIU is funding this, they’re happy with the work you guys are doing, so we’re going to continue for at least six months.” On January 19, 2012, SEIU headquarters contributed $191,797 to Action Now, the first in a series of donations that would total more than $3 million by year’s end. An SEIU staffer with knowledge of union politics in Chicago explains, “Action Now here is very closely connected to the largest SEIU local in the region—SEIU Healthcare Illinois/Indiana. They have a history of cooperative, overlapping campaigns.” Starting in its first full year of operation in 2008, Action Now has received $100,000 or more annually from the healthcare local. In contrast, all three Chicago organizers say that by February, SEIU personnel were coming to their offices specifically to train them in union organizing. In other words, while SEIU maintains that Fight for 15 is a bottom-up project, the organizers who did the legwork concluded that SEIU funded and directed it from early on. In the summer, when organizers shifted to phoning workers about unionizing, Chris says he conducted a dozen one-on-one meetings with workers and “typically most workers were fearful. Most of them were not happy with their work situation, but they did not want to lose what they had.” He recalls that the first meeting in lower Manhattan in late August 2012 attracted about 30 workers, and at least two more meetings drew similar crowds before Nov. 29, 2012—the campaign’s first big strike. Looking for assistance in early 2013, Sam and co-organizers started attending meetings of the Worker Organizing Committee of Chicago, which was formed in November 2012 to lead the Fight for 15 campaign. The decision to conduct a nationwide strike on August 29 was made in a similar manner, at an SEIU-led convention in Detroit on August 15 to 16 that brought together about 700 low-wage workers, organizers and staff from around the country. Sam says that on the second day, an SEIU organizer got in front of the crowd and said,“We have this idea to do a national day of action, Chicago, what say you?” According to Sam, someone preselected by SEIU stood up and replied, “We in Chicago are ready to do a national day of action.” Sam says the process was repeated with the other cities.“There had been no discussion on it previously in any meaningful sense. The first time most people [from Chicago] had heard about it was on the bus to Detroit.” Two other workers confirm they had little say in the decision other than being asked to rubberstamp a prepared statement when they showed up in Detroit. By the spring, strikes were staged in a different city every week, rolling through New York, Chicago, Detroit, St. Louis, Milwaukee, Kansas City, Washington, D.C., Seattle and Flint, Mich., and generating a national media buzz. To help get out the word, SEIU is employing several communications consultants. Journalist Peter Rugh, who has been tracking the fast-food campaign since 2012, says that according to employees of New York-based company Purpose, which specializes in “21st-century movements,” the firm is helping with branding. In Washington, D.C., SEIU worked with M+R Strategic Services to coordinate an extensive social media effort around a May 2013 fast-food and low-wage worker strike. Nationwide, sources say, SEIU has retained the aid of BerlinRosen. The communications firm declined to comment on the record, but Charles (not his real name), a Detroit organizer with knowledge of SEIU strategy, says his impression is that BerlinRosen is “helping in every spot” around the nation, and its work included “local communications, teamwork … advising on communication strategy, generating coverage.” He adds that, in addition to “showing strength to the workers [and] getting the community behind it,” the purpose of the campaign is generating a media buzz. In 2012, combined payments to BerlinRosen from SEIU Healthcare Illinois/Indiana and SEIU headquarters soared to $1.2 million, doubling from 2011 and tripling from 2010. A few SEIU organizers voiced concerns to In These Times that airing criticisms of Fight for 15 would aid right-wing and anti-union forces trying to undermine the campaign. That may be true. But the criticisms are coming from workers and field organizers across the country who say they’re concerned that the top-down organizing may benefit SEIU leaders at the expense of the workers. For instance, some workers say that while they welcome the spotlight, the glare can be damaging. Media generates public support, but also more pressure on organizers to turn out workers for high-profile actions. Some organizers worry that a lack of time for proper back-up or training may put workers at risk of employer retaliation. In many instances, the fast-food campaign has vigorously defended workers against retaliatory firings by picketing the employer or filing unfair labor practices. But Jason criticizes Fight for 15 in Chicago for mounting strong defenses after a firing, but not helping workers develop skills to prevent retaliation in the first place. “The strategy is to wait until [bosses] actually fire you because they can get more publicity. But it’s easier to keep your job instead of fighting to get it back.” He believes that in general, the media emphasis undercuts shop floor organizing. Chicago is one city where worker-led organizing is thriving. Sam says, “At the shop level we control the messaging, we control the tactics, we decide what we want to organize around, we motivate the strikers.” Following the April 24 strike, workers demanded a greater say in meetings. The next decision to strike, in mid-July, was a vote with a 30-minute discussion and a count of those for, against and abstaining. It passed overwhelmingly. “It represented a very big step forward in terms of the actual practices within the union,” says Jason. Now, up to 200 workers attend meetings in Chicago every other week. They have been given resources to publish a newsletter for workers to help “tighten organization between the stores.” There’s a women’s caucus where women can strategize about “sexual harassment at work and unsupportive husbands who don’t want them to be involved,” and workers can also discuss how managers use racial discrimination to divide and control workers. 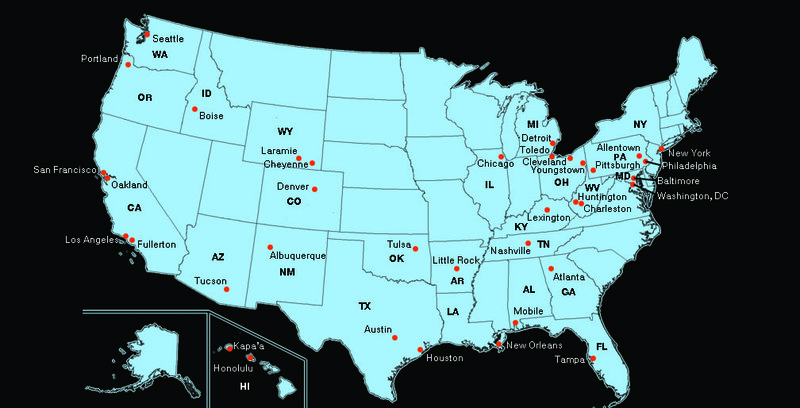 Outside of Chicago, however, there’s little evidence of worker-to-worker organizing. In Seattle and Washington, D.C., sources say active workers number a dozen or less, about the same as the number of paid organizers. Victor (not his real name) in Seattle says the campaign is faltering because workers are “babied at the meetings.” He says the process involves workers getting “amped-up” and “rubber-stamping some decisions that are already made,” which wears thin after the first meeting. That retreat is a reference to SEIU’s troubled history, especially under the 1996-2010 presidency of Andy Stern. Many workers are wary of SEIU’s track record of “coziness with big employers, limits on internal democracy, [and] excessive deference to Democratic party leaders,” as In These Times staff writer David Moberg wrote in July 2012. Workers also fret about SEIU’s tendency to sign neutrality pacts that “surrendered basic worker rights” in return for new members, Moberg noted. And what will that win be? SEIU appears to be pursuing several strategies simultaneously. Campaigns in Seattle and Washington, D.C., have pushed for living-wage ordinances. SEIU seems also to be interested in supporting fast-food worker centers—workplace advocacy organizations that are not formal unions. Two sources say SEIU is helping to start a new branch of Restaurant Opportunities Center United in Seattle and is considering supporting ROC chapters in other cities. But conversations with various SEIU sources—as well as statements from the leadership and developments in fast-food organizing around the country—indicate SEIU also has a comprehensive national plan in the works, centered on the two public demands of $15-an-hour pay and the right to unionize free of intimidation. If successful, the multi-stage strategy would allow SEIU to secure collective bargaining agreements and gain thousands of new union members. The first step is to challenge the legal distinction between a corporation and its individual franchises. Take McDonald’s: Ninety percent of its 14,000 U.S. restaurants are franchises, but the corporate parent micromanages key aspects of the business—menus, promotions, insurance, software, advertising, cleaning and so on. At the same time, McDonald’s takes pains to spell out in contracts that it has “no implied employment relationship” with a franchisee or their workers. SEIU aims to hold corporations liable for their franchises’ actions. Second, SEIU is pouring resources into compiling data about wage theft in the fast-food sector. Sam says researchers come to worker meetings and state: “If your register is short and that difference comes out of your paycheck, come talk to us. … If you get your paycheck on a debit card and there are fees associated with it, come talk to us.” In May, Fast Food Forward, the New York chapter of the fast-food organizing campaign, released a survey finding that 84 percent of 500 fast-food workers reported at least one form of wage theft. The third planned step, organizers say, is for SEIU to use legal liability for wage theft to pressure fast-food companies into accepting “neutrality agreements” that allow employees to unionize without management interference. Fourth, SEIU plans to mount an international campaign by enlisting unions in other countries to pressure fast-food chains with global operations. But in the interview with Salon in August, SEIU President Mary Kay Henry and her assistant Scott Courtney hinted this is the path being pursued, saying that options include a “political or legal challenge” to the fast food industry’s franchising. Despite the uneasiness some organizers have about SEIU’s role, others doubt that a truly spontaneous, worker-led uprising would have been possible without SEIU leadership. If liberals drew the unambiguous conclusion that real power lies in the markets, with the corporate-owned media, and think tanks and universities endowed by the wealthy, then they would be calling for massive street protests to counter the full-court press Wall Street is placing on new Mayor Bill de Blasio, says Gupta. Saints make the worst role models. How precisely can one emulate Nelson Mandela, a “supernatural human” who moved mountains of injustice, except by becoming him, which is impossible because he was a saint? Saints stand above history, making choices based on internal moral struggles and exhibiting unimpeachable fortitude, faith and grace. This implies events were ordained and could not have been otherwise. We are afraid to see Mandela as captive of history because it may tarnish his memory. But that’s a mistake. The bitter history of post-liberation South Africa does not diminish the heroic and costly struggle to end apartheid. The Afrikaner elite negotiated the end of apartheid after mass movements made South Africa ungovernable in the ’80s, and its military was defeated in a regional war. Mandela and the ANC (African National Conress) made a fatal miscalculation, however. They decided that political liberation for all people meant economic liberalization for corporations that propped up and profited off the racist system. In short, racial apartheid was replaced with class apartheid. In 1993 a transitional government that included the ANC endorsed an IMF (International Monetary Fund) structural adjustment package. The roots of this policy were planted a decade earlier when leaders of the United Democratic Front, which coordinated the antiapartheid resistance, gambled that democratic rights should be secured before economic rights. Critics presciently argued that socialism delayed would be socialism denied. Because the defeat of liberation forces by capital happened rapidly in South Africa under a revered leader like Mandela and with the majority thirsting for economic and social justice, there are important lessons for our time. South Africa’s shift to class apartheid parallels US history in which Jim Crow was dismantled but eventually replaced by Reaganomics class warfare. One lesson is to keep up the street heat. After being elected in 2008, Obama ditched progressive rhetoric for austerity policies: protecting banks, dithering on the home foreclosure crisis, calling for Social Security and Medicaid cuts and deficit reduction. It was only thanks to Occupy Wall Street that the national debate was flipped from austerity to economic inequality. Occupy has faded but its impact is still felt in low-wage worker organizing, minimum-wage initiatives, climate-justice organizing, and the elections of Kshama Sawant to the Seattle City Council and Bill de Blasio, who will be inaugurated on January 1, 2014, as the 109th mayor of New York City. The 99% Mayor, de Blasio’s “tale of two cities” has resonated across the country because most Americans are locked out of gilded communities zoned by race and class. De Blasio is no Mandela, but his candidacy was propelled by low-wage worker movements, the grassroots coalition against stop-and-frisk policing, and anger over economic inequality. Rather than lead the charge against this soft apartheid, however, de Blasio will be another liberal enforcer for the 1%. Once victory was in hand, De Blasio moved to appease the markets by calling himself a fiscal conservative, tapping stop-and-frisk architect Bill Bratton as police chief and a Goldman Sachs exec to fight inequality, and signaling that mega-real-estate projects would be approved, if with less public aid. He and his officials will now move in a world of boardrooms, penthouses, Michelin-starred restaurants, and galas where they will hear the woes of the oligarchy. At least he won’t be as cartoonish as Bloomberg, who fantasized about every Russian billionaire moving to the city, police profiling minorities more, and poor neighborhoods hosting waste incinerators. But his policy-making will involve horse-trading with liberal bigwigs and union leaders who will agree to toss crumbs to millions of struggling New Yorkers and call it progress. There is another option: Strive to make the city ungovernable. Let me explain. What made Occupy potent was that it was a continuous, populist protest that rattled Wall Street and paved the way for de Blasio. His victory has raised hopes, but he will not address inequality unless movements from below disrupt the status quo, like the anti-apartheid movement did in South Africa. If movements can learn from Occupy’s failures and organize strategic protests and strikes that mobilize the public to confront de Blasio’s proposals as inadequate, which they will be, then there’s a chance to redistribute some wealth and power in meaningful ways to the 99%. Despite months of organizing, a quarter-million students joining walkouts, and workers’ sympathy strikes, the state crushed the uprising, leaving hundreds dead and thousands jailed and tortured. The Black Consciousness movement’s emphasis on ideas as prior to physical liberation appealed mainly to students, especially those in universities, instead of the black working class it needed to win over. This limited organizational development and the chance to keep up the momentum from Soweto. The breadth of the uprising also showed the movement had achieved its aim of changing consciousness. This spurred a turn in the movement overall from a racial analysis to class and nonracial organizing. Additionally, events in mid-70s South Africa were influenced by liberation struggles that freed Angola and Mozambique from racist European rule similar to apartheid. Many youth gravitated to ANC politics after serving time in prison with senior leaders. Thousands of others fled the country and were recruited by the ANC, which alone had the resources, discipline, and organization to house, educate and train, allowing it to rebuild its internal network and popular stature. Obviously there are huge differences with the here and now, but there are intriguing similarities as well. For example, Occupy Wall Street was also influenced by international events, such as the Arab Spring, learned the hard way that the movement behind the ideas can crumble, and succeeded in changing consciousness by popularizing the terms 99% and 1%. But after the state counterattacked in late 2011, Occupy groups failed to develop strategies beyond attempted re-occupations, solidarity campaigns and service work. Additionally, while Occupy’s power lay in its elegantly simple class critique, internal fissures erupted across the country between radical and liberals and over identity politics. The former led to splits over whether to work within the political system or build utopian models outside of it. Debates over identity politics often led to internal struggles that alienated many participants. These self-inflicted blows were compounded by Occupy’s disregard for strategy or even organization. Not surprisingly, liberal outfits, unions, community groups and workers centers picked up the banner of inequality. One exception is climate-justice organizing, which has attracted post-Occupy activists to its radical grassroots bent. But it’s also sundered by a class analysis, similar to what happened in South Africa. Radicals argue for an anti-capitalist strategy as it’s the main culprit in global warming, while those who call themselves realists contend system change is a luxury as the collapse of civilization is nigh, so we should pursue green solutions compatible with capitalism. Marx notes Black Consciousness adopted a class analysis after Soweto to provide common values of resistance, and it could help build mass organization by overcoming an individualistic approach to fighting oppression. Many Occupiers went the other way, from collective politics to individualism by fixating on the abstractions of identity – fighting “privilege” – rather than the material effects of oppression linked to identity. Consequently, Occupy, as a movement, missed an opportunity to organize low-wage workers, who are disproportionately people of color and female. Just like the ANC attracted youth after the anarchic Soweto Uprising was quashed, unions have used their resources and organizational structure to attract Occupy activists looking to continue the fight against the 1%. Members of socialist and anarchist organizations have joined the campaigns as well, enabling them to collectively analyze strategies and debate and implement plans to radicalize the low-wage worker movement. But Occupiers rarely join as part of a group engaging in collective strategizing. Additionally, liberals and unions use dumbed-down class analysis for partisan or instrumental ends, instead of wielding class as a strategic tool to forge different social relations. During the 2012 election, they stole Occupy’s thunder by tarring Mitt Romney as an out-of-touch one percenter, playing a big role in the re-election of Obama, who has dutifully managed the interests of the 1%. In South Africa, movements learn from history and their mistakes. When a brutal crackdown in the mid-’80s cooled mass rebellion that was destabilizing South Africa, activists did not blame the state. They took repression as a given, and instead criticized the United Democratic Front for what they saw as a lack of militancy. With Occupy, however, many still cling to the myth that police ended the movement despite copious evidence it disintegrated because of internal conflicts and strategic missteps like futile re-occupations. More recently, South Africa’s largest union, the National Union of Metalworkers, announced it was cutting funding to the ANC and would not back it in the 2014 elections. Outlining a strategy that would be unimaginable coming from an American labor leader, NUMSA plans to form a “new United Front that will coordinate struggles in the workplace and in communities, in a way similar to the United Democratic Front of the 1980s,” and launch a new labor party by 2015. 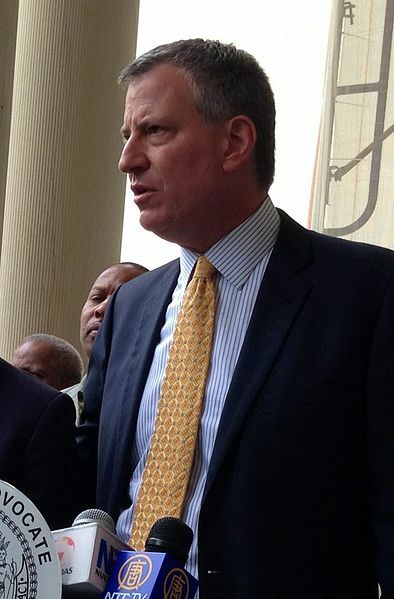 Under de Blasio, modest reforms are possible including strengthening a flawed paid sick leave act, boosting the minimum wage for those employed in city-subsidized projects and extending it to more than 600 workers a year covered by a 2012 bill, and creating a municipal ID to help undocumented immigrants access services. But this is tinkering at the edges, and wish lists are barely more ambitious. The Nation calls for implementing de Blasio’s proposal to tax the wealthy to fund universal pre-K. It’s a fine idea, which requires the approval of the state legislature, but it won’t begin to “reverse” the dramatic widening of the income gap, unless one has a timeline of 20 years to evaluate results. Supporters assume de Blasio can wrest concessions from the rich without any leverage over them. He won’t challenge the class apartheid suffocating most New Yorkers. He won’t be a reverse Bloomberg, re-engineering the city to make it the playground of workers instead of the gilded elite. Even if the overt racial profiling is rolled back, it will be replaced with class profiling of the homeless, panhandlers and street vendors that is defined by race, which is what Bratton did as Los Angeles police chief a decade ago. If de Blasio installs Bratton with minimal opposition progressives will embolden him to pursue Wall Street’s agenda, which is why it’s positive that opposition has emerged to Bratton, led by parents whose children were killed by the NYPD during his previous tenure as police chief. Without organized opposition, De Blasio’s policies will not alter the 46 percent of city residents in or on the cusp of poverty or alleviate the extreme housing crisis that ranges from hedge funds and investors buying 70 percent of homes in Brooklyn to extended families of a dozen or more stuffed into two-bedroom apartments in my tenement building to the Lower Manhattan “human kennel,” where men pay $300 a month to live in squalid “chicken-wire cages” smaller than a jail cell. Any more social welfare is welcome, of course, but if de Blasio won’t commit to even an $11.50 an hour minimum wage, how will he address inequality? The wealth divide in the city is so extreme a household with two full-time workers earning $15 an hour would find its entire pre-tax income consumed by the average rent of $3,800 in Manhattan. And Brooklyn’s not far behind, with an average rent of more than $3,000. If liberals drew the unambiguous conclusion from their arguments that real power lies in the markets, with the corporate-owned media, with think tanks and universities endowed by the wealthy, then they would be calling for massive street protests to counter the full-court press Wall Street is placing on de Blasio. Now, nurturing an uprising is far from simple or even likely, but we do live an era where they are increasingly common because the political center is so slavishly devoted to capital. In the United States alone, since 1999, there’s been the global justice movement, the anti-Iraq War movement, the immigrant May Day general strike and Occupy Wall Street. If there are any illusions, it’s among the liberals who expect dramatic change from a de Blasio administration while they tell the left and workers to be quiet.